Autonomy to lower level organizational structures (wherever it is needed) is traditionally argued based on three broad reasons – rights, efficiency and accountability. The ‘rights’ based argument is that it is the right of the people or community over the public organization or resources and hence should be honoured. The efficiency based arguments suggest that in some cases, centralized systems are ineffective, can’t address local needs and unnecessarily increase the response time. Hence, certain autonomy should be given to lower levels of the organizations or government to address this. The accountability based arguments suggest that involving communities in decision making process of schools or hospitals can act as bottom-up pressures enforcing accountability and now that the decision is in people’s hands, it is empowering and they don’t need to wait to lodge their grievances with someone else. In the context of education, effectiveness and accountability arguments are generally discussed in the discourse on decentralization and autonomy. This section discusses the current scenario, evidence, need and challenges regarding school and district autonomy. 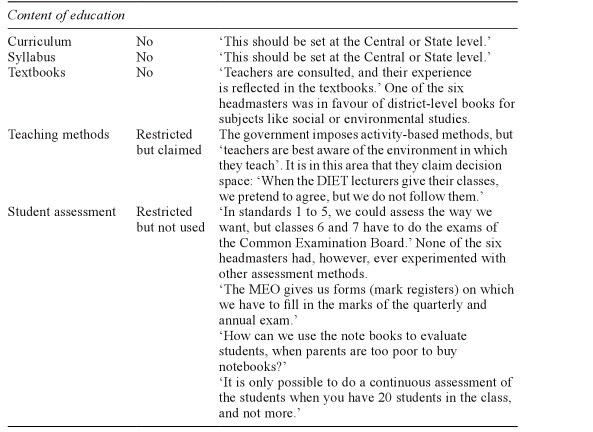 Manabi Majumdar and Jos E. Mooij in their book ‘Education and Inequality in India: A Classroom View’ outline the decision space for head teachers, based on their discussions with headmasters. The PAISA report by Accountability Initiative also reports similar response in terms of administrative decisions. “All critical teacher-related decision-making, hiring and salary payment for example, lie with the state administration. Funds for infrastructure development are often channeled to schools; however, key decisions related to implementation - sanctions and procurement are taken by the district administration. While the ASER 2013 12 district takes implementation decisions, priorities on the nature of infrastructure to be created are set by the State government, often in response to pressures placed on it by the Government of India (GOI). For instance, in 2011, the Supreme Court of India issued an order requiring that all schools meet the RTE norms for girls’ toilets by the end of the year. This resulted in a rush of activity in many states to initiate toilet construction. Orders were issued to districts, which in turn directed schools to start construction. These top-down decisions result in serious distortions during implementation. In 2013, PAISA researchers undertook a workflow analysis to try and understand the consequences of top down decision-making in infrastructure. The following anecdote best illustrates our findings. In a school in Nalanda, Bihar, the Headmaster had received a grant for building a boundary wall in 2012. When asked “When did you make the request for the wall?” here’s what he told our researchers: he never did! The wall was sanctioned at the state level based on DISE data, and finalized at the district level. When asked if he was satisfied with the way the civil works process was conducted, he shrugged his shoulders and said, “The wall is built, this is good. But the main problem here is the lack of clean water as the children get sick. We don’t know who to talk to about this. And honestly, the DISE form doesn’t ask us for this information”. Interwoven in this top-down system is an intent to involve schools and parents in decision-making through school management committees. However, in practice, schools and therefore school committees and parents have control over very small amounts of money - in 2012-13, this accounted for a mere 2% of the total SSA budget. These monies arrive in schools as school specific grants (which the PAISA survey in ASER tracks) that are tied to specific expenditure items – so if a school wants to spend its school development grant on buying reading material, well the rules won’t allow it. In essence, then, PAISA has taught us that the top-down decision making governance system in education has resulted in a mismatch between school level needs (even of the most basic things like inputs) and actual expenditure”. The Right to Education Act (2009) mandates the formation of School Management Committees (SMCs) with the intent of involving communities in the administration of local schools. However, the powers of these committees are limited as reported by PAISA study above. The recruitment and transfers of teachers is another often raised concern. In some states, the recruitment is done at state level though the allocation is at a district level. It means that, candidates of a particular district are transferred only within that district but the notification for transfers for all districts comes from state level, and transfers across state have to be conducted at same time. Similarly, filling up of teacher vacancies is a political decision and often it takes significant time to get vacancies filled up. Thus the need to align resources with local needs, enhancing bottom up pressure to strengthen the accountability, acknowledging the possibility of diversities in instructional practices, and decreasing the response time have called for greater devolution to districts and schools. The school districts in US, which have significant powers, are also often sighted as best practices. It is argued that, though autonomy may not be the panacea but at least it won’t be worse than the current scenario. There is some evidence suggesting that autonomy can hurt in certain contexts. Hanushek et al. [i] analyzed the responses to questionnaires in PISA survey linking them with the PISA test scores. The results “suggest that autonomy affects student achievement negatively in developing and low-performing countries, but positively in developed and high-performing countries”. Further, they report that negative effect in developing countries emerges most clearly for autonomy in areas relating to academic content, but also appears for autonomy in the areas of personnel and budgets. This evidence needn’t be seen against the proposal of decentralization but highlights and important lesson – the aspects of decentralization matter. Decentralization is a theme and there can be lots of aspects that can be decentralized. One has to exercise cautious judgment regarding this. For example, in certain contexts where there is lack of capacity and teachers are already overloaded, decentralizing decisions regarding curriculum can affect negatively. It is then the judgment of policy makers depending on the resources available, whether to appoint additional teachers and free up teachers time or to have centralized curriculum for time being. However, there can be other aspects that can be decentralized needless. This also brings back the classic old debate (also discussed earlier), what to do in systems with low state capacity regarding tasks which need autonomy. This suggests that capacity should be factor in considering the amount of autonomy to be given to lower structures. In cases with lower capacity, rule based approaches (lower autonomy) can be effective compared to autonomy in same contexts. In cases with higher capacity, greater autonomy can be effective compared to rule based approach in the same context. This assumes that all tasks are amenable to rule based and autonomy based approaches. What if it is not feasible to get the tasks executed through rule based approaches? In the graph above, the minimum autonomy needed is fixed at higher level. 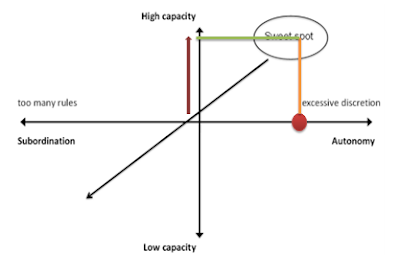 If that’s the case, then the only way to reach the autonomy-capacity sweet spot is to increase the capacity. It is not the question of positive effects of autonomy in higher capacity contexts vs. negative effects of autonomy in lower capacity contexts but it is about higher autonomy vs. lower autonomy for a given context. In other words, for a given state capacity, lower autonomy can be worse compared to the higher autonomy yet ineffective situations. This brings us to the question, what to decentralize? The PISA school survey questionnaire[iii] asks the degree of autonomy available to schools on the following aspects. There can be other possible aspects and sub-aspects of those mentioned below, but these serve as a good starting point. The decisions to decentralize these can depend on the context, capacity and other aspects but there are some aspects that can be certainly decentralized in Indian scenario. While context, capacity and other aspects can be considered for decisions regarding devolution, we need an operational thumb rule; ‘need for iterative adaptation’ can be this thumb rule. This means that those aspects which need focus for long time, have to be continuously revised based on feedback addressing local needs, need autonomy to be executed and where multiple solutions are possible, can be decentralized to the appropriate level, factoring in capacity and resources (economies of scale) etc. As per this, thumb rule there are three aspects that can be certainly devoluted to the district level. 1. Teacher training: In the section on teacher training, we discussed its nuances, concerns and challenges. Teacher training is that aspect which needs focus & ongoing-support has to be customized to local needs and there are various possible forms of designing them. Traditionally, teacher trainings follow cascading model where few people called Key Resource Persons (KRPs) are trained at state level, who further train resource persons at district level, who then train resource persons at cluster level and they deliver trainings to teachers. Need for uniformity across the state in some of these trainings. 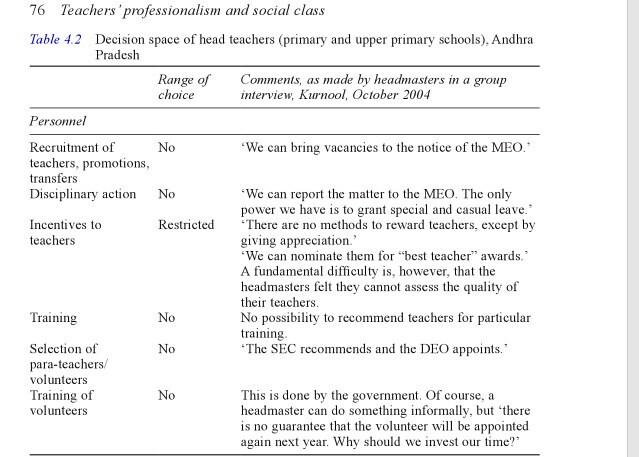 The results haven’t been encouraging as detailed in the section on teacher training. Teacher training is one aspect that can be certainly decentralized to district level, where state can provide necessary inputs as and when necessary. DIETs are set up in each district for the same purpose but it is akin to forcing the districts to only take help of these for training purposes. DIETs often suffer from lack of infrastructure, staff and other typical aspects, hindering their operations. Giving necessary money to districts and handholding initially to build capacity can be considered. Districts can then use this money to get training services from other organizations instead of being dependent only on government machinery. Districts can thus have access to variety of options and also can get trainings customized to their district. Depending on the contexts, some forms of these trainings can also be devolved to further levels down. 2. Teacher recruitment and transfers: In some states, though teachers are bound to work in their home district, all of them have to take a central test and wait for a state level notification. Teacher appointments are sometimes subject to political decisions and also feature in manifestos before elections. This delay in appointments can hurt schools. Instead, in cases where candidates are appointed to only home districts, each district can have their own recruitment procedure instead of waiting for state level procedures. If necessary, the question paper etc., can be monitored in a time bound manner at the state level. Since it is done at a district level and not at a school level, the concern of losing out on quality candidates due to decentralized recruiting is also addressed. In case of recruitments, there can be some arguments on whether it should be done at state level or district level, but teacher transfers have a stronger case for devolution. In some states, currently transfer procedures are all done at same time, only after approval of state level authorities, though each district has to conduct their own transfers independently. It would be better if the districts can conduct their transfers as and when required, and if necessary state government can set maximum period between consecutive cycles of transfers. 3. Procurement and approvals: Tasks like printing textbooks, approvals for procurements has great scope for decentralization. Even if the curriculum is designed and textbooks are decided centrally, the printing of these textbooks can be done at district level to address problems like late delivery etc. These are some of the aspects that have strong case for decentralization as per the existing situation. In future, proposals like having customized textbooks to districts for subjects like social sciences etc. can also be considered. Currently, our approach to reform is fragmented – teacher trainings or assessment or building infrastructure etc. However, in reality, the basic operating unit of education is school and the problems are around this unit, and can differ with each. Learning outcomes is a complex function of several variables which are again dependent on the context of the school. Unless all of these are taken care of, it is difficult to achieve the possible goals. For example, a typical school has to deal with following aspects in varying proportions. Assessments design, evaluation and feedback. Building systems for schools - data capture and management system, building automatic report generation systems. Outreach, Marketing, publicity and PR. Each school may be facing constraints in different aspects, of varying proportions. Thus, one needs to have a school transformation plan considering all these aspects with autonomy to execute it, and not to get into long procedures of approvals. In aspects where certain amount of centralization is necessary and economies of scale are involved, they can be done accordingly but ensuring that school specific concerns are addressed and the required services aren’t delayed. Need for default options: One of the concerns of decentralization is that, if certain aspects are completely left to lower levels, it can be overburden them, and can be ineffective if they don’t have enough capacity to design and execute those. It is thus advisable to give autonomy along with default options. For example, if one wants to devolve certain aspects of curriculum, government can set up a default curriculum but then give autonomy to teachers tweak around a bit, if they deem it as necessary. 1. Need for assessments – The advantage with centralization is that the central monitoring authority knows what’s going on, what’s supposed to go on making it easier to monitor. Decentralization by definition breaks these standard approaches and hence also makes it difficult to monitor. It is argued that in such cases, outcomes should be monitored and not approaches. This underscores the importance of regular assessments to gauge performance and necessary investments have to be made on this front. 2. What to decentralize – As discussed earlier, the aspects to decentralize has to be done carefully. One needs to make note of this observation from the research shared above - if motivated individual teachers adapt as per needs of students using the autonomy, it will be beneficial to students but if unions design approaches keeping the lower workload to teachers in mind, it might be detrimental to students. 3. Norms of decentralization - Decentralization is an abstract theme. Its fruits can only be realized if the decentralization norms are appropriate. For example, take the case of Sarva Shiksha Abhiyan (SSA) grants to schools. In theory, this can be called decentralization because funds are being given to schools to utilize as per their needs. But, the norms for this grant approval can create bottlenecks at times. PAISA report documents example of two nearby schools. The details of grants to two schools in Maghara and Kharjana villages are as follows. What’s the problem? 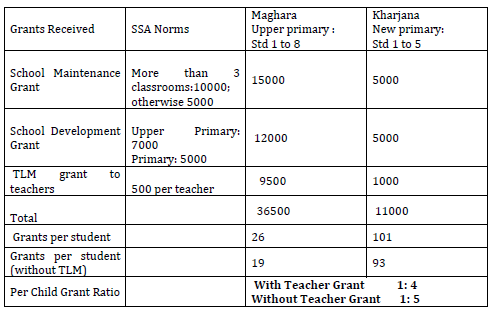 – “As per the norms, Maghra gets only three times the total grants that Kharjama gets, although Maghra has 10 times the student strength of Kharjama.” This is because grants are not given on per student basis but as described in the second column of the table. The case of School Management Committees (SMCs) is similar. In theory, bodies called School Management Committees are created and to ensure accountability but SMCs often have negligible powers. It is reported that SMCs have powers to decide spending of only 2% of the budget granted under SSA. 4. Process inefficiencies – Even some aspects are decentralized, issues regarding flow of money and their delays can derail the essence. As discussed earlier, PAISA documents that around half of the schools don’t receive money even by November which is half way past the academic year. One of the prerequisites for parents to be able to enforce accountability is to know the learning levels of the children. The survey in this study finds that parents’ understanding of students’ learning levels are disconnected with the actual learning levels. “67 percent of the parents of the children who could read nothing thought they could at least read letters, and 38 percent of the parents of the children who could barely decipher letters thought their children could read and understand a story. The picture is even more distorted in math, where a full 83 percent of the parents of the children who could only recognize numbers, but could neither subtract or divide, believed that their children could perform subtraction problems”. The not- so encouraging aspect is that, for one group of schools, researchers provided information about learning levels of the children but it didn’t result in any outcomes. The second prerequisite is that students should know their powers and responsibilities of SMCs. The second group of parents in the Banerjee et al. study were given information about the powers and responsibilities and VEC (SMC) meetings were facilitated but still it didn’t result in outcomes. This suggests that communities face constraints in influencing schools. This emphasizes to re-look at the expectations from the communities. May be they can be expected to monitor visible activities like attendance in school etc., while not relying completing on communities regarding other aspects like classroom procedures, trainings, assessments etc. Some instances where community led initiative seemed to have worked are those where a local NGO has strongly supported the activities. 6. Social hierarchies – It is argued that skewed social hierarchies in villages can be an impediment in enforcing accountability through communities. While this is a concern in general spanning other aspects as well, one has to acknowledge that reorienting these equations takes time and has to be given enough time, while working on other aspects as well. [iv] Banerjee, Abhijit V et al. 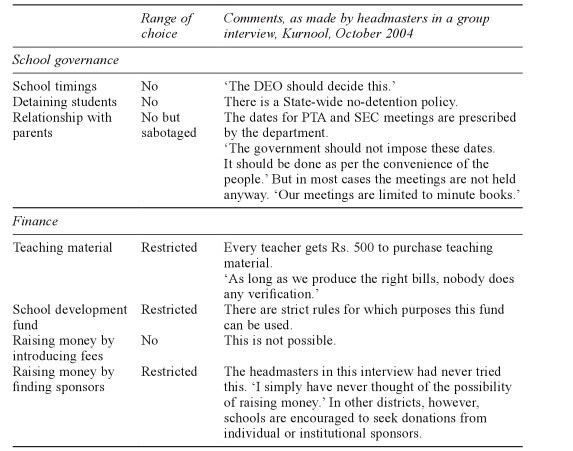 “Pitfalls of Participatory Programs: Evidence from a Randomized Evaluation in Education in India.” American Economic Journal: Economic Policy 2.1 (2010): 1–30. Web. 24 May 2012.